Wave energy is the energy from wave motion. Waves are caused by the force of the wind "pushing" on the water surface. The stronger the wind, the bigger the waves. In bodies of water, such as the ocean, there are frequent waves. Needless to say waves move, and the intensity of their movement dictates how much energy can be extracted from them. The movement of waves is complicated. They can move up and down, sideways, and so on, so it's a challenge to figure out how to extract energy from them. In wind and tidal energy, for example, energy is extracted from wind, or water, that moves in one direction. This is done by placing a turbine in the direction of the flow. The flow then turns the turbine blades which generate electricity. But for wave motion the process of energy extraction is not as simple. This is why there are numerous energy extraction methods for extracting energy from waves, depending on the type of wave motion there is. 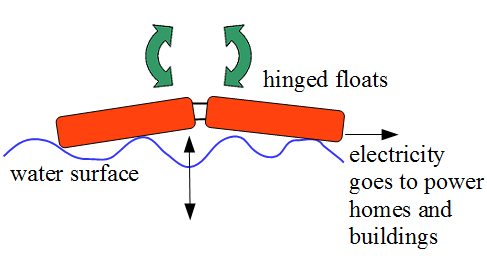 One such method of extracting energy from waves is with floating cylinders which are hinged together using special hinges which are connected to hydraulic generators inside the cylinders. An example of this type of system is shown in the picture above. These cylinders float on the water surface and move relative to each other in response to the wave motion. The relative motion of the cylinders causes the hinges to "flex" which drives the hydraulic generators which then produce electricity as a result. The schematic below shows how two hinged cylinders move in response to the wave motion. 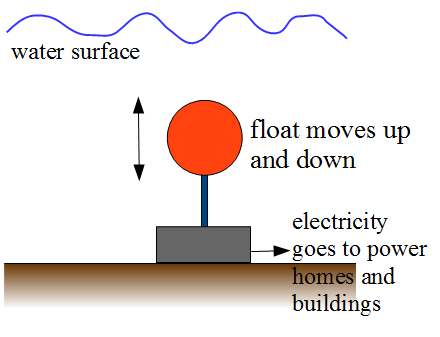 Electrical energy from waves can also be produced by an underwater piston and a float, as shown below. As the float rises and falls in response to the underwater wave motion, it moves the piston up and down. This piston then pumps high pressure water through a generator to produce electricity. The disadvantage of using wave energy is that it is only produced when there are waves present. This disadvantage can be overcome with energy storage devices which store wave energy, when there are waves present, for use when the water is calm and there are no waves present. An example of these devices are large batteries and pumped storage hydroelectric stations.